The Canadian Hypertension Society updates their recommendations annually based on the evolving evidence. Whereas the recommendations are kept current, it can be difficult to keep up clinically with rapidly evolving guidelines. The CHEP (Canadian Hypertension Education Program) has a coordinated dissemination strategy for their latest recommendations that is second to none, but implementation, therapy and compliance are still sub-optimal. 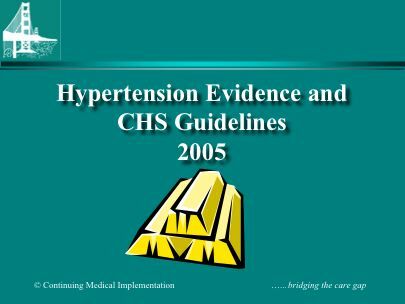 The 2006 Canadian Hypertension Society Recommendations were released on the CHS Website January 25, 2006. For 2005 the CHS focuse5 on the evidence supporting expedited assessment of both the hypertension-related risk of atherosclerotic disease, as well as a more global atherosclerotic risk assessment. As well the 2005 CHS recommendations support the concept that blood pressure control supercedes putative pleiotropic effects of individual medications or classes of medications. In 2006 the focus is on expedited diagnosis of hypertension and measures to improve patient compliance and adherence. Targets are simplified with the elimination of the < 125/75 target for patients with non-diabetic chronic kidney disease. Additional sources of hypertension guidelines include the JNC from the NHLBI . JNC 6 (2000) has been supplanted by JNC 7. The JNC 7 Express summary has been published as of May 21, 2003 in JAMA The accompanying JAMA Editorial details the worldwide CARE GAP in hypertension control. The full JNC 7 report is available on the NHLBI website. The joint European Society of Hypertension/ European Society of Cardiology ESH/ESC Hypertension Guidelines 2003 is available for download from the ESH website. The WHO/ISH Guidelines were reviewed in 2000 and a statement on this review has been published in the Journal of Hypertension (ref: J Hypertens. 2003 Nov;21(11):1983-1992). This review places special emphasis on public health implications and evidence-base of recommendations. The WHO has also published a document on the Integrated Management of Cardiovascular Risk that details worldwide strategies of CVD Risk Management stratified according to available technology. Visit the WHO Cardiovascular Disease website for further details. For 2006, the recommendations incorporated ASCOT-BLA12, ALLHAT diabetes subgroup13, MOSES14, VALIANT10 and SHEAF1 publications as well as a number of smaller studies, systemic reviews and the Cochrane Database. 1. Bobrie G, Chatellier G, Genes N, et al: Cardiovascular prognosis of “masked hypertension” detected by blood pressure self-measurement in elderly treated hypertensive patients. JAMA 2004; 291(11):1342-9. 2. Asayama K, Ohkubo T, Kikuya M, et al: Prediction of stroke by self-measurement of blood pressure at home versus casual screening blood pressure measurement in relation to the Joint National Committee 7 Classification. The Ohasama Study. Stroke 2004; 35(10):2356-61. 3. Ohkubo T, Imai Y, Tsuji I, et al: Home blood pressure measurement has a stronger predictive power for mortality than does screening blood pressure measurement: A population-based observation in Ohasama, Japan. J Hypertens 1998; 16(7):971-5. 4. Clement DL, De Buyzere ML, De Bacquer DA, et al for the Office versus Ambulatory (OvA) Pressure Study Investigators: Prognostic value of ambulatory blood pressure recordings in patients with treated hypertension. N Engl J Med 2003; 348(24):2407-15. 5. Staessen JA, Thijs L, Fagard R, et al for the Systolic Hypertension in Europe Trial Investigators: Predicting cardiovascular risk using conventional vs. ambulatory blood pressure in older patients with systoic hypertension. JAMA 1999; 282(6):539-46. 6. Thijs L, Staessen JA, Celis H, et al: Reference values for self-recorded blood pressure: A meta-analysis of summary data. Arch Intern Med 1998; 158(5):481-8. 7. Julius S, Kjeldsen SE, Brunner HR, et al for the VALUE Trial Group: Outcomes in hypertensive patients at high cardiovascular risk treated with regimens based on valsartan or amlodipine: the VALUE randomized trial. Lancet 2004; 363(9426):2022-31. 8. Poole-Wilson PA, Lubsen J, Kirwan BA, et al for the A Coronary disease Trial Investigating Outcome with Nifedipine gastrointestinal therapeutic system investigators: Effect of long-acting nifedipine on mortality and cardiovascular morbidity in patients with stable angina requiring treatment (ACTION trial): Randomised controlled trial. Lancet 2004; 364(9437):849-57. 9. Pepine CJ, Handberg EM, Cooper-DeHoff RM, et al for the INVEST Investigators: A calcium antagonist vs. a non-calcium antagonist hypertension treatment strategy for patients with coronary artery disease. The International Verapamil-Trandolapril Study (INVEST): A randomized controlled trial. JAMA 2003; 290(21):2805-16. 10. Pfeffer MA, McMurray JJV, Velazquez EJ, et al for the VALIANT Trial Investigators: Valsartan, captopril, or both in myocardial infarction complicated by heart failure, left ventricular dysfunction, or both. NEngl J Med 2003; 349(20):1893-906. 11. Blood Pressure Lowering Treatment Trialists’ Collaboration: Effects of different blood-pressure-lowering regimens on major cardiovascular events: Results of prospectively-designed overviews of randomized trials.Lancet 2003; 362(9395):1527-35.